Our work has ranged from automotive computer vision to proprietary natural language processing solutions, read about some of our most interesting projects below. Interactive Coventry is developing a driver assist device for identifying and modelling hazardous situations and providing real-time and offline feedback to the driver and to relevant stakeholders. This device utilises a unique multi-layered hybrid computational intelligence algorithm for defining, modelling, and identifying danger levels during driving. We take a new holistic approach for identifying and modelling hazardous situations. Our approach considers the driver’s behavior and driving style as well as environmental factors in order to recognise potential dangerous situations, and produce feedback to assist the driver. Our solutions are able to identify a wide range of driving/road conditions such as weather, traffic, time of day/year, and individual driving styles to create a uniform measure of the driver’s performance. In order to achieve its goals our product proposes a unique combination of inputs and utilises a novel multilayer algorithm. Interactive Coventry Ltd, in collaboration with Coventry University and a Malaysian industrial partner, has received a prestigious funding award to lead the development of an advanced urban flooding monitoring and forecasting platform. 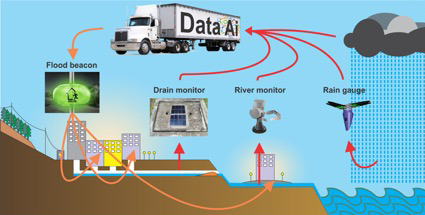 The project titled “Flood Ultra-Cognitive Dendrite (FLUD)” will build upon state of the art research, and technologies in computational intelligence and machine learning, to develop an urban flooding monitoring and forecasting platform. FLUD aims to minimise the impact of flash floods through developing an economically sustainable and effective technical approach to flood-alert systems. The proposed solution will provide accurate, and timely predictions enabling corresponding authorities to carry out pre-emptive actions in order to minimise the devastating effects of severe urban flooding, and support effective decision making in matters such as installation and maintenance of the necessary infrastructure, allocation of resources, traffic network management etc. The developed system will be tested at two high-risk sites in Malaysia to validate its operational effectiveness with urban authorities. The final product will be benchmarked for utilisation in smart city projects in Malaysia, the UK, and other countries facing extreme urban flooding. For a long time, the gap between user and database has been a tangible one. Efficient access to the data a person needs is impossible without either their knowing a query language or knowing somebody who does. IC believes that this shouldn’t hold any company back, so we have created an effective tool which bridges this gap by allowing users to query a database in English, directly from their browsers. 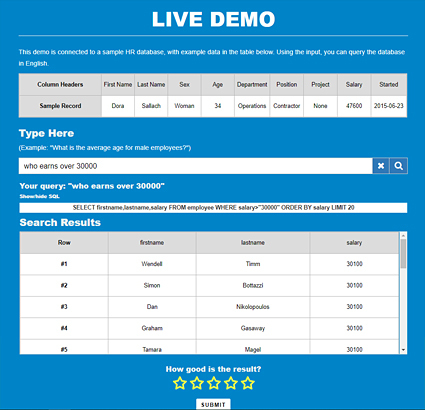 IC developed a unique software solution called Querify, that utilises NLP techniques to produce an SQL statement with which a database can be queried. SQL Querify is designed to work with relational databases, giving data in JSON format or directly to our application frontend, depending on the customers needs. Our solution incorporates state of the art machine learning and a robust design, and it is specifically designed to be easy to configure and customise for a wide range of databases.